More than half of U.S. mobile customers use smartphones? According to a Pew study, more than half of mobile phone owners in the U.S. own smartphones – and 46% of all adults claim they do. This would be consistent with the growth of smartphones sold in the U.S. in the latter half of 2011, although although the Pew numbers are slightly ahead of where ComScore and others show smartphone sales. It’s worth sounding a note of caution – Pew’s data is derived from a poll of customers, not from doing a survey of distribution channels and retail outlets. Both methods have strengths and weaknesses, but Pew relies on individuals to self-identify whether they have a smartphone or not. Given the rate at which messaging phones and other feature phones attempt to keep up (at least on paper) with smartphone features, it’s entirely possible that self-reporting may over report the rate of smartphone adoption. Along those lines, only 20% of Americans said they own an Android phone in the Pew study, which is much lower than the actual percentage of Android phones sold. This probably isn't an error in Pew's methodology, but instead indicates that many consumers are unsure of exactly which smartphone platform they own. In particular this discrepancy suggests that the Android brand is not as recognizable to consumers as Apple’s iBranding is. Some of this is probably due to OS customization (someone with an HTC Sense phone may not realize it’s the same operating system as an Android phone from Samsung or Motorola), and additional confusion may be sown by carrier branding (not all customers realize that a “Droid” is one of Verizon’s marketing brands for a portion of their Android line of phones). These caveats aside, Pew’s numbers are likely not too far off, and current sales trends suggest that even if we haven’t quite reached the 50% point for smartphone sales in the U.S., we’re very close. 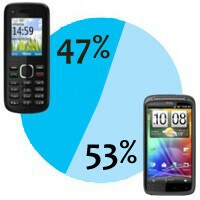 It will be interesting to see whether crossing that threshold leads to the collapse of the feature phone market (feature phones already have low margins, and collapsing market share may lead to manufacturers abandoning feature phones), or if there is a bedrock of consumers who simply won't purchase a smartphone. We'll find out as 2012 progresses. The moment "platform" is mentioned, Android vs. iOS wars begin no matter what site you're on. So true. Both sides start arguing like kids. How about we start commending both and be done? lol. These polls are such BS. They should ask each carrier out of all their customers, how many are smartphones? You can't just ask 2,000 people and base your stats on that.